Fresh, delicious vegetables should be a staple of any diet, but if you've decided that you'd like to take your Meatless Mondays to a whole new level, then it might be time to ditch the processed foods and meats and try out a vegetarian diet. Eating vegetarian doesn't have to be complicated! In fact, it can be downright scrumptious and satisfying. The Easy Vegetarian Kitchen helps you to create simple meals that will help you live a happier and healthier life. Erin Alderson, the popular voice behind the whole foods, vegetarian blog Naturally Ella, shows you how to easily eat plant-based vegetarian meals every day. 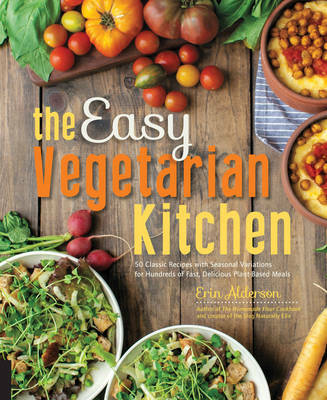 With 50 core recipes for everything from entrees to appetizers and desserts, The Easy Vegetarian Kitchen guides you through staple recipes such as salads, sandwiches, stir-frys, and stews and easily adapt them to seasonal or oh-hand ingredients. Enjoy spring's fresh asparagus in a delicious frittata and change it up for winter with Curried Butternut Squash and Feta. Core recipes allow readers to build an essential pantry list so eating vegetarian is always easy. And if you feel like going vegan, each recipe can be easily adapted with flavorful substitutions. Start filling your kitchen, and your belly, with healthy, plant-based ingredients and start eating your way to a happier meat-free life.